Our modern world is filled with technology that is the product of miniaturization including the computer chip and many other devices - just like these. Without the process of miniaturization, the modern world would look very different indeed. This process has given us, in part, the computer chip, mobile phones and laptops to name but a few. In the field of electronics principles like Moore's Law have seen progressively smaller and more powerful processors being built over time. This is a trend that is not set to end anytime soon, but it might have limits. In only a few decades, gadgets have gone from literally filling a room to being able to be carried around in your pocket. In this article, we will explore 17 interesting examples of the 'fruits of labor' from miniaturization and range from novelty gadgets to future developments in medical sciences. The following list is far from exhaustive and is in no particular order. Please feel free to add your suggestions for another neat tech in the comments below. First up is this teeny tiny camcorder, DVR, webcam, and camera. It is so small that you can hold on a single finger and it is capable of taking 2-megapixel images. Its mini 200mA battery provides around 90 minutes of usage time and takes about 3 hours to recharge. The entire kit weighs in at a tiny 10 grams and it includes a microSD card. Given its size, you won't be able to view images on the camera itself - after all, there is no mini screen. To view images/videos taken, users need to remove the SD card to view on a computer or other card reader. Intel went one step further with their answer to creating technology that can fit on a computer chip with their Intel Compute Card. This device is an entire computer into no bigger than a credit card. Incredibly, all these features fit within a device 95mm long by 55mm wide by 5mm thick. That is just a little bigger than a credit card. 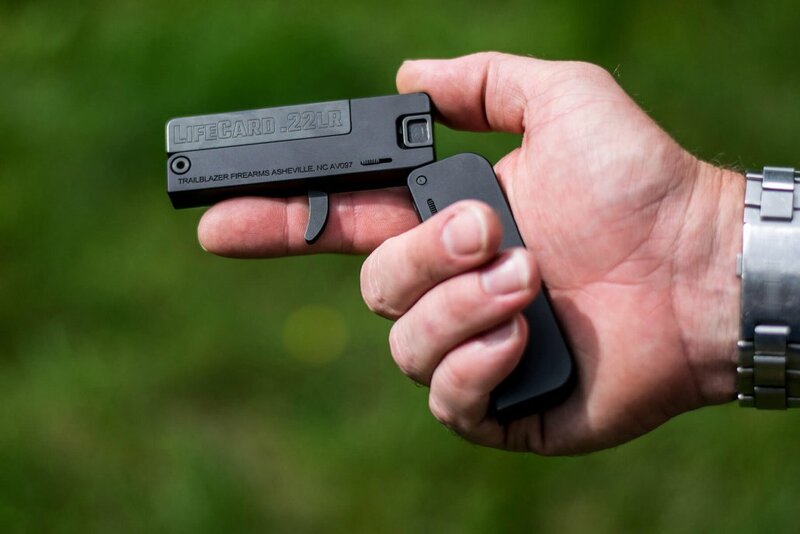 The LifeCard is a foldable gun that is no bigger than a credit card and fits easily into your pocket. When it was released, it was marketed as 'the last gun you'll leave behind'. Each LifeCard has a capacity for a single .22LR round with a four round capacity in its carry case. Each LifeCard weighs in at a tiny 198 grams and measures in at 8.6 cm by 5.6 cm and 1.27 cm thick. LifeCard is designed and manufactured by the North Carolina company Trailblazer who is a firearms startup founded in 2014. Their flagship product was specifically designed to be as small and lightweight as possible and was the product of over 7 years of development. Each and every LifeCard comes equipped with a steel barrel, bolt, and trigger and fits into a leather storage case when folded down. The LifeCard comes with fail-safes that prevent accidental firing when closed and is made from steel and aluminum. An interesting device that could fit on a computer chip is this smart finger digital measuring tool. You've probably found yourself using your fingers to 'guesstimate' small distances at some point but this small device will actually give an accurate measurement. As you move your thumb and index finger apart or closer together, a digital distance measurement is displayed on one of the fingers. Measurements can also be stored for future reference. Each finger is made of silicon and is marketed as being able to fit any finger size. Once worn, they are ideal for measuring lengths, breadths, and even volumes. The Game Boy Micro was Nintendo's answer to the call for tiny computer chip-sized tech. It measures in at 5 centimeters wide and weighs in at a paltry 85 grams. Released in 2005, it was later discontinued by Nintendo in 2008, but you can still find it on sites like Amazon and eBay. Nintendo released the Micro as a compact redesign of its classic Game Boy Advance and it would be the last in the line of Game Boys. Unlike all of its predecessor Game Boys, the Micro lacked any form of backward compatibility of games that had become a hallmark of the Game Boy series. Its functions were ostensibly similar to the Game Boy Advance SP but featured a much greater level of miniaturization and sleeker design. When it was first released, it sold around 170,000 units in Japan. It was originally sold for $99 in the U.S. and was highly customizable with its removable faceplate features. Nipper is a tiny, dice-sized emergency phone charger that is marketed as being the world's smallest. Its small size means it is very portable and can even be attached to your keys. The device lets you make use of AA batteries to provide an ever available source of emergency power for your portable device - so as long as you have AA batteries available of course. To use it you need to take Nipper of its key-ring, separate its two parts and snap them onto the ends of the batteries. Then just plug it into your phone and emergency power is all yours. Nipper was brought to market, thanks to a successful Kickstarter campaign but can now be purchased from their website. For those who need a USB stick and love the original '80's Transformers series will absolutely love this miniature device. It's a USB stick that can transform into the iconic Decepticon Ravage. Although the original character actually transformed into a cassette tape this modern take on the character is refreshing indeed. It was originally released in 2009 but can still be bought today. The device can easily transform between Ravage form and USB form and can come in three sizes - 4, 8 and 16 GB. Like most modern USB sticks, it supports USB 2.0 and is also compatible with USB 1.1. It is a great gadget that we couldn't resist including. We are confident Soundwave would approve. Walkie Talkies have long been a favored plaything for children of all ages, but this one beats them all by being small enough to fit on a computer chip. It's manufacturers claim that it is the world's smallest Walkie Talkie and for good reason. As small as they are, these Walkie Talkies are fully functional 2-way radios that have a range of around 30 meters. According to sales information, the signal is able to penetrate walls, floors, steel and even concrete (within reason of course). Each little Walkie Talkie measures in at 2.5 by 4.4 by 15.2 cm and weighs only 99 grams. You can still buy these from sites like Amazon but be warned that the reviews are less than scintillating. External speakers have been very popular for many years but few are as small and compact as this mini speaker. Like other entries on our list, it can fit on the end of your finger and it only weighs 482 grams. Released way back in 2007, this speaker came with a foldable audio jack that could be plugged directly into your devices audio port or hidden away inside the cube itself. This tiny cube speaker measures in at 26 by 26 by 26 mm and is compatible with most iPhone's, iPods and Nanos. This tiny speaker was charged using a USB cable and provided around 4 hours of playtime. At the time of release, it retailed for around $10 dollars but has since been discontinued, unless of course, you find a used one. The Japanese wristwatch maker Citizen actually made a teeny-tiny robot that can easily fit into the palm of your hand. The so-called Eco-Be! measured only 1.8 cm wide and 2.5 cm tall and was also controlled by infrared. Eco-Be! had all the mobility you' expect and was powered by watch batteries and constructed using Citizen watch technology. The Eco-Be! was originally unveiled in 2006 in Japan and appeared at RoboCup 2006 in Germany the same year. Citizen developed the robot in the hope that it would prove informative for further miniaturization to make smaller and lighter robots. At the time they had planned to conduct further research with Osaka University. The little robots were certainly a novelty at the time. In 2015, it was reported that a Swedish Company has started implanting chips under their worker's skin to increase its security. These chips were to replace more traditional ID cards which obviously be lost or stolen. Each of the RFID (radio-frequency identification) chips is about the size of a grain of rice and can be used for many applications from gaining access to a building to using photocopiers or even paying for things in the future. The chips were offered to each of the 400 staff at Epicenter hi-tech office block in Sweden to a mixed reception. Epicenter utilized the services of a Swedish bio-hacking group who believed this kind of technology would kick-off worldwide. This technology is becoming popular in other organizations, like Disney, too. IBM have recently unveiled their recent development in computing - a tiny computer only 1 by 1mm. That's impressive enough but it has the same computing 'power' as a '90's desktop. IBM has said that the minicomputer is more powerful than x86 chips from 1990 and it is cheap to make too - only about ten cents each. Their relative size and power should see them fitted into many other devices in the future. Arvind Krishna (IBM Head of Research) believes that “Within the next five years, cryptographic anchors — such as ink dots or tiny computers smaller than a grain of salt — will be embedded in everyday objects and devices," said IBM head of research Arvind Krishna. He also believes advanced chips like this could have applications in blockchains. "They will be used in tandem with blockchain’s distributed ledger technology to ensure an object’s authenticity from its point of origin to when it reaches the hands of the customer." If you have ever seen the late '80's film Innerspace, you will instantly recognize the significance of this technological development. Back in 2014, it was reported that a tiny 'Camera' only 1.5 mm in diameter had been created that could have significant medical implications. The device uses ultrasound imaging techniques to create real-time images of the inside of a human body, like inside your arteries. It is, in fact, a donut-shaped silicon chip with a 460-micron hole in the center that houses sensing and transmittal circuitry. The chip creates sound waves using a thin film that flutters 0.00005 of an mm. Reflected waves are then captured using its array of 100 sensors which are then processed and transmitted to an external monitor at 60 fps. In future, it could, in theory, replace two members of a traditional surgery team who, prior to this chip, would need to examine low-fidelity cross-section images to guide the surgeon. It could find many applications from integration with more traditional surgical tools like scalpel blades or other in vivo tools. Stitches or sutures of the future could integrate an array of sensors to monitor the healing progress of a wound. These 'smart' sutures have been developed by researchers who successfully developed a coating for regular threads to allow them to conduct electricity. This further opens up the possibility of integrating small sensors directly into a healing wound. Sameer Sonkusale, an electrical engineer at Tufts University, and his team managed to coat regular cotton with electrically conducting materials. This means that the special stitches can now be used to collect information and report on what's goings on beneath a bandage and within the wound. They can be used to gather information on things like the stretching of the site (indicating swelling), changes in pH (indicating potential infection) as well as temperature information. This device can then be used to send data wirelessly to a nearby smart device or computer to act as a means of real-time monitoring of the would and healing process. Such sutures could also be used for uniform and direct administration of drugs using the threads wick effect. Scientists at the Centre of Excellence for Ultrahigh bandwidth Devices for Optical Systems (CUDOS) are currently developing a new hybrid 'chip' that promises to be more advanced and faster than conventional integrated circuits. Normal everyday 'chips' are effectively a set of electronic circuits set on a flat piece of semiconductor material (usually silicon). This has worked well for many decades but does have some limitations for data processing. The CUDOS Physicists might have found a solution to these limitations with optical circuits that are made of chalcogenide glass. This special glass is used today in ultrafast telecom networks transferring information at the speed of light. The team, in collaboration with physicists from the Unversity of Sydney’s Australian Institute for Nanoscale Science and Technology (AINST), the Australian National University (ANU) and RMIT University, have managed to integrate optical circuits with more traditional silicon-based chips. “The breakthrough here is this realization that we can actually interface, we can integrate that glass onto silicon and we can interface from silicon to the glass very efficiently – we can harness the best of both worlds,” - Professor Eggleton (CUDOS Director and ARC Laureate Fellow Professor Benjamin Eggleton from the University of Sydney) said. Scientists at the Institute of Photonic Sciences (ICFO) in Barcelona, Spain have managed to squeeze IR light between a layer of graphene and metal. The two materials were separated with dielectric insulator only an atom-thick. Research lead Professor Frank Koppens said, “Graphene keeps surprising us: nobody thought that confining light to the one-atom limit would be possible." Koppens et al research was recently published in Science and could up the new applications for communications and sensors on the nanometer scale. This will enable the development of very small devices in the future indeed. Unlike previous attempts at a similar technique Koppens and his team have managed to achieve the feat without significant loss of energy from transmitted light. Other teams had managed a similar result but found they couldn't reach atomic-widths without losing a lot of energy. ICFO is part of a 1 Billion Euro European research initiative called the Graphene Flagship that hopes to bring academia and industry together to find practical everyday applications for graphene in society. Hopefully within the next decade or so. “Having reached the ultimate limit of light confinement could lead to new devices with unprecedented small dimensions." says The Graphene Flagship's science and technology officer Professor Andrea Ferrari. Japanese researchers have recently managed to develop a micrometer wide thermometer. This device could have many important applications to explore heat transport on the micro and even nano scales. These scientists from the Tokyo Institute of Technology developed their tiny thermometer to be sensitive to heat generation from optical and electron beams. This means it could easily be integrated into optical microscopes and synchrotron radiation experiments very soon. Experts in the field are very excited by this development and state that there is an urgent need for devices like this that can measure thermal properties on the nanoscale and in real time. It could have important uses in photo-thermal cancer treatment, provide means for advanced research into crystals and provide a means for optical light harvesting to name but a few. The team was able to use a nano-thin membrane and a focused beam of light or electrons to create heat source with a diameter less than 1 micron. When combined with a micro-thermocouple detector a tiny thermal microscope system was effectively built. This system can be regarded as a new "toolbox" for investigating heat transport behavior on the micro- and nano-scales, with many important applications in a wide range of fields. So there you go, 17 devices and new technologies that can fit on a computer chip or business card. Given the enormity of miniaturized technology out there we have only selected a few so please feel free to add your suggestions below in the comments.